Our high performance aluminium sliding folding (bi-fold) doors are set within a rebated framework to allow for superior draft proofing and heat retention. Depending on the overall width of aperture, we can supply 2, 3, 4, 5 or 6 pane sliding folding doors. When the doors are in the open position, they provide a fully panoramic view to the outside. The opening options are varied with doors sliding open to the left, right or from the centre or other point. 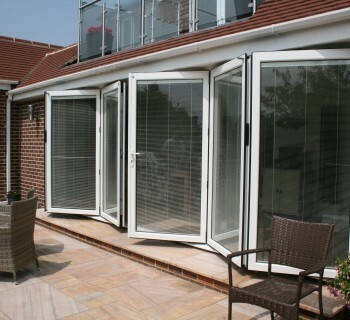 They can be tailored to your requirements depending on the number of panes required. This is determined at the point of survey. The doors are built with multi-point locking for enhanced security and meet the requirements of PAS 23 & 24 for Secure by Design. They are fitted with high energy efficiency glass sealed units, available in a large number of styles. Optional vertical and horizontal mid rails can also be fitted. For an aesthetically pleasing look, both the framework and doors have been designed to keep the sight lines to a minimum, whilst still maintaining the strength and rigidity expected of an aluminium door. They are supplied in white as standard but can be powder coated in any standard RAL colour to meet your specific requirements. We offer a choice of glazing units with window energy rating bandings from ‘A’ to ‘C’ and can advise on achieving U-Values. We can supply sealed units with glass thicknesses ranging from 4mm to 36mm.